There are many species of Monarda, but all have the following things in common: the plants have square stems; the leaves are simple, serrated, opposite, and have petioles; there is a distinct smell of mint when the leaves are crushed; the large flowers arise from a whorl, and sometimes the whorls are stacked up on the stem; the flowers of Monarda are tubular; each flower has two lips: the upper lip is long and narrow; the wider lower lip has three lobes. In the wild, flower colors include red, pink, and light purple. Common names for plants in this genus include bee balm, horsemint, bergamot, and Oswego Tea. I think the light purple plant in this set of photographs is wild bergamot, or Monarda fistulosa. The red Monarda in the gallery is commonly called bee balm, or Monarda didyma. 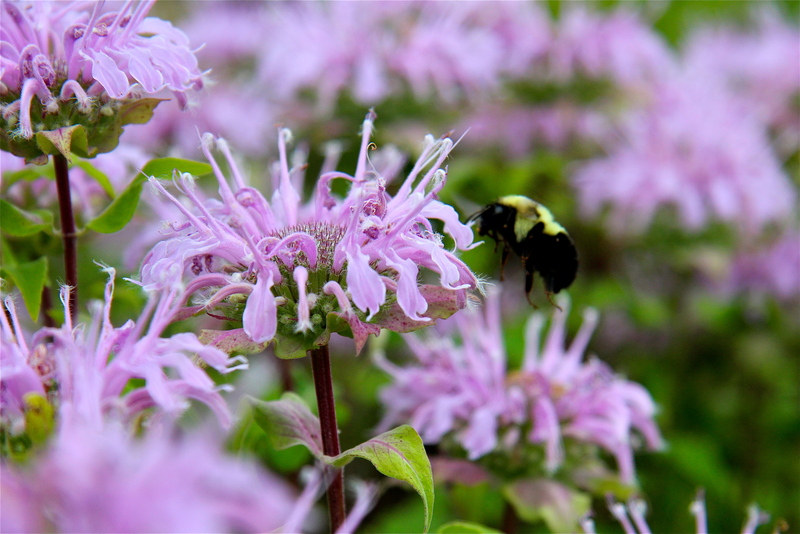 Butterflies, hummingbirds and bees use Monarda as a nectar source. It is commonly planted in gardens to attract wildlife and also to provide a “naturalized” appearance in a border. (Beware: white-tailed deer will eat this plant.) Monarda prefers full-sun and moist soils. Some species spread easily (even aggressively) by underground stolons. Bloomtime is mid- to late summer. Native Americans made use of the antiseptic properties of Monarda to treat wounds and throat infections. A tea made from the leaves was also used as a stimulant and as a treatment for headaches. As a kitchen herb, it was sometimes used to season wild game, especially birds. The leaves contain thymol, which today is an active ingredient in mouthwash. There is a white-flowering bergamot called Basil Bee Balm. Read more about it here. I enjoy many stands of monarda fistulosa and monarda didyma in my garden. They have all stopped blooming and now the gold finches are having a feast on the dying fistulosa flower deads. Never seen that before but thrilled!